All-on-4 changes what has become traditional thinking with regard to immediate loading for the edentulous patient. The concept has near universal application, with a simplified approach to the entry-level fixed restoration that has the potential to make this treatment affordable for an even greater segment of our population. -Dr Stephen Parel, DDS, MS, BS, USA The science of safety The documented success of All-on-4 is based on the proven tilting technique of the two posterior implants. Protects the mandibular nerve and maxillary sinus for a safer surgery Improves anchorage by enhanced bone-to-implant contact Optimizes load distribution due to balanced implant placement Preview the patient results Reduced patient treatment times with immediate loading Enduring stability from angled implants in better quality anterior bone Individualized esthetics you design, with a choice of custom prosthetics All-on-4 with NobelProcera Implant Bridge Prosthetic flexibility with NobelProcera The All-on-4 treatment concept includes the exceptional esthetics of NobelProcera. 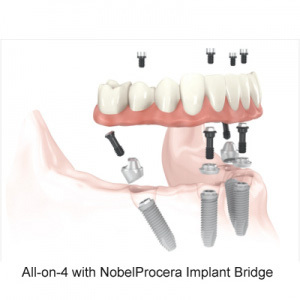 You experience the freedom to perform the final restoration with fixed solutions such as NobelProcera Implant Bar Overdenture or fixed-removable solutions such as NobelProcera Implant Bridge. Patients benefit from a provisional, fixed prosthesis that’s as unique as their new, confident smile. From start to finish NobelGuide is the inside partner for All-on-4, optimizing implant placement through 3D diagnostics, digital treatment planning and guided surgery with a surgical template. "NobelGuide has been a natural evolution for us and is an essential part of our clinical practice. My clinical partners and I plan every case with 3D radiology data through NobelGuide; this makes it simple to get predictable and accurate results that meet our high demands for esthetics and functionality every time." Dr Leonard Marotta and Mr Steven Pigliacelli, USA Dentist Toolbox Our partnership opens access to a range of clinical practice solutions: Patient education brochures, treatment card and local events kit Marketing tools to promote your practice to patients Points bank that grows with every purchase for complimentary products StudyClubConnect to communicate and stay informed with dental professionals To discover more services that support our scientific innovation, visit us at www.practiceresourcecenter.com The Nobel Biocare difference Nobel Biocare is a global leader in science-based, tooth-to-root dental solutions for all indications. Headquartered in Switzerland, we focus on safety, education and innovation to reduce treatment times and improve patient outcomes. Through strong partnerships with dental professionals, our advanced esthetic and restorative treatments help patients worldwide. Explore all of our edentulous solutions at www.nobelbiocare.com.